A skin ulcer simply means a loss of a patch of skin. There are many causes for this. In your case, the cause comes from the veins just under the ulcer. Your veins are a little bigger than normal. These are called varicose veins because they look a bit like a wine bottle from ancient Greece (varix). A varicose vein is a superficial (close to the surface) vein lying under the skin. It has swollen because of overspill of blood from veins running deep in the muscles of the legs. 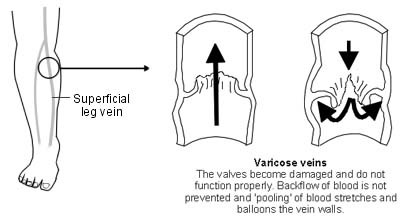 This happens because certain valves that allow the blood to flow from the superficial to the deep veins of the leg and not the other way around are not working any more. The problems with your varicose veins are not their size, but the high pressure and sluggish flow of blood inside them. These cause aching, cramping, itching, staining of the skin, eczema and finally ulcers. The ulcers are often very painful. They can bleed and get infected. In the long term they can range from a minor handicap to possible serious illness. Most varicose ulcers will heal. The key to the treatment is to put continuous pressure on the underlying veins. One of the best ways of doing this is to squeeze the veins with bandaging. The latest way of bandaging is to use four different types of bandage all at the same time. This is what you may have. The pressure dressing is far more important than any ointments, powders, granules, or dressings on the skin. Sometimes the blood supply is not good to the leg. The skin is starved of blood as well as being damaged by the pressure. The doctors may need to do special tests and suggest other treatment for this. You will not need to have any anaesthetic. The aim is to get your ulcers healed. This means you wear a bandage on your leg for as long as it takes. Most people heal up inside 16 weeks. You need to have the bandages changed each week. Your ulcers are measured to make sure they are healing up. Once the ulcers have healed, the aim is to keep them that way. This might mean injection treatment, or an operation for some people. For others, some type of support stocking may always be needed. When you see the surgeon, he will check you have straightforward varicose ulcers and nothing else. He will also look into any other surgical problems you may have. You will need to be patient, but the ulcers will nearly always heal in time. These notes will help you through your procedure. They are a general guide. They do not cover everything. Also, all hospitals and surgeons vary a little. If you have any queries or problems, please ask the doctors or nurses. Varicose Ulcer Treatment India, Cost Varicose Ulcer Treatment ,Varicose Ulcer Treatment India, Low Cost Varicose Ulcer Treatment Delhi India, Varicose Ulcer Treatment Hospital Delhi, Varicose Ulcer Treatment Mumbai Hospital, Cost Varicose Ulcer Treatment Mumbai, Delhi-India, Low Cost Varicose Ulcer Treatment Hospital, Affordable Varicose Ulcer Treatment Hospital Mumbai, Delhi, Cost Varicose Ulcer Treatment Hospital Delhi.